1. The diagram below represents a human foetus in a uterus. 3. 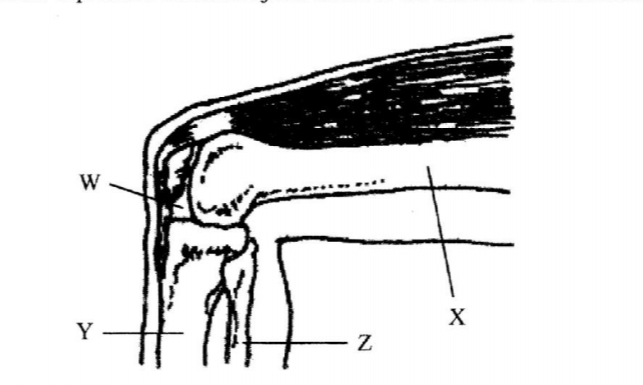 The diagram below represents bones at a joint found in the hind limb of a mammal. 4. 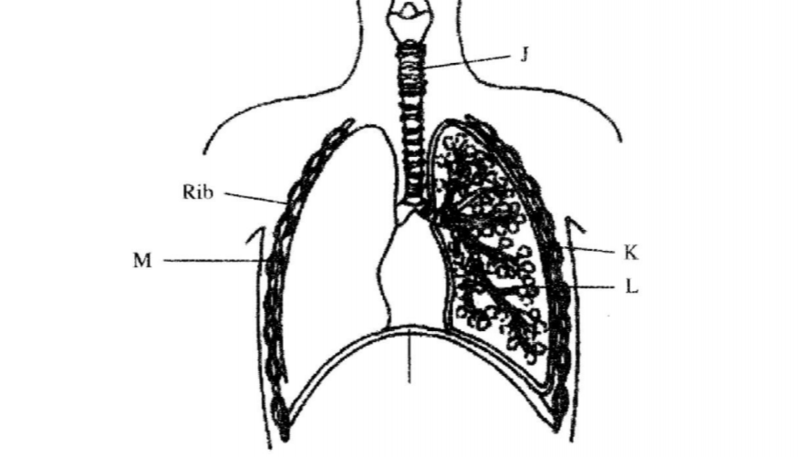 The diagram below represents some gaseous exchange structures in humans. 5. A freshly obtained dandelion stern measuring 5cm long was split lengthwise to obtain two similar pieces. The pieces were placed in two different solutions of different concentrations in petri dishes (L. and L2) for 20 minutes. The appearance after 20 minutes is as shown. 6. 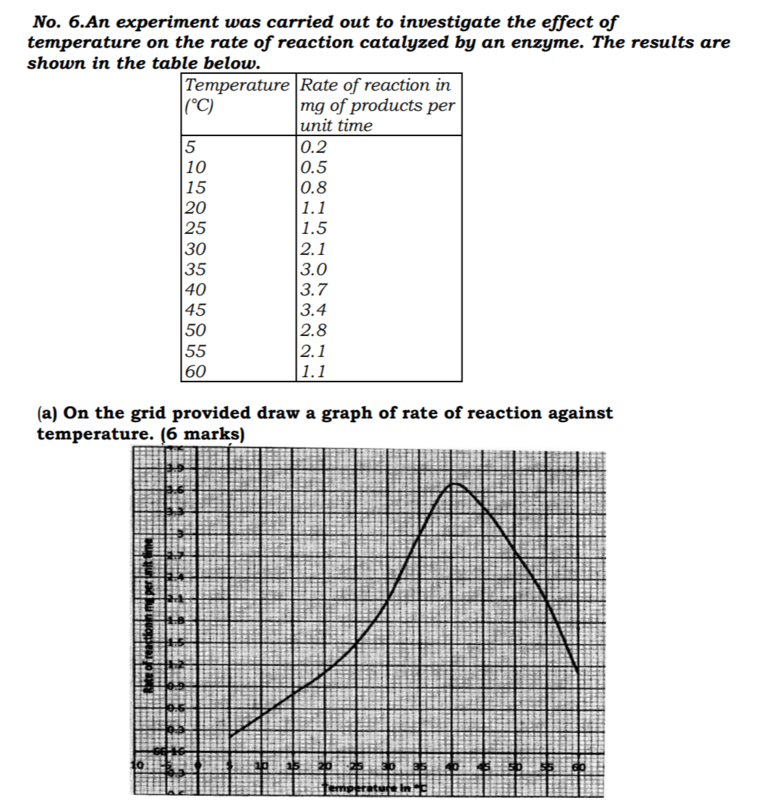 An experiment was carried out to investigate the effect of temperature on the rate of reaction catalysed by an enzyme. The results are shown in the table below. (e) (iii) above is later neutralized. No. 4. The diagram below represents some gaseous exchange structures in humans. ❖ Mycobacterium tuberculosis (underline separately). Reject if not done so. ❖ Li - Inner cells gained water by Osmosis; hence increased in length; epidermal cells did not gain water because they are covered by a water proof cuticle leading to curvature. 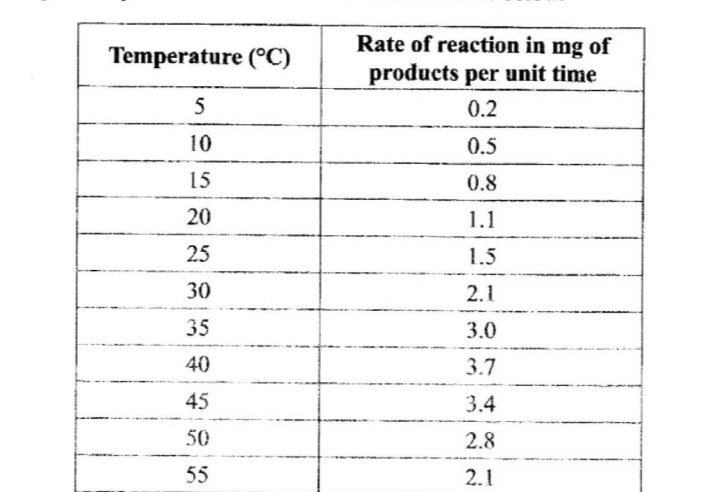 ❖ As temperature increase rate of reaction decreases less/ products are formed (unit per time) because enzymes become denatured by high temperatures above 40°, hence cannot act on substrate. ❖ intermediate/ associative/ connector/ interauncial neurone - for relay. The effector muscles/ biceps contract; and the finger is withdrawn from the hot object/ sharp object; conditioned reflex action - salivation in a dog/ human being (ace. 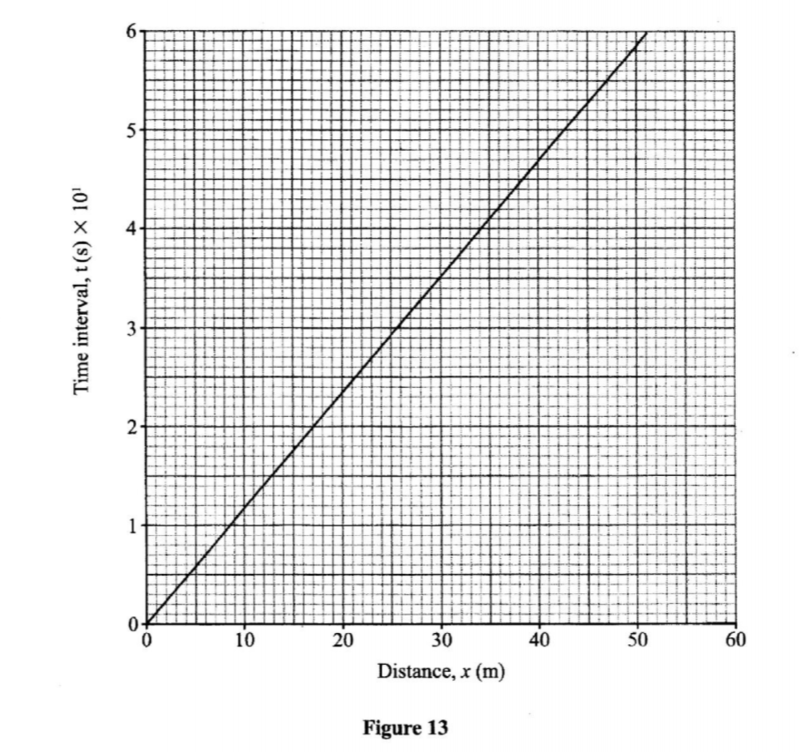 any other relevant example) student in response to sound; it is an automatic response evoked from an animal by unrelated stimulus; substituted for the one which normally elicits the response; it develops from a past experience; and involves modification of behaviour/ involves learning; it weakens with time; and must be reinforced by repeating the related stimulus; the dog/ student salivates when the bell (for meals) rings; because they have learnt to associate the ringing of the bell at meal time with food; everytime it rings (accept use of other relevant examples) they are offered food. ❖ Wall of the left ventricle is thicker than that of right ventricle to pump blood over a long distance. ❖ Has venacava and pulmonary vein to supply blood to the heart. ❖ Has aorta and pulmonary artery to transport blood away from the heart.